This is not as upbeat as most of our articles, but it is very important and often unknown. Grapefruit juice, and possibly other citrus, can rapidly increase uptake of many medicines, including causing some time-released medicines to instantly release. If you are taking medications, please check to see if they are one you should not drink grapefruit juice or eat grapefruit while taking. The patient didn’t overdose on medication. She overdosed on grapefruit juice. They were mystified: The patient’s husband said she suffered from migraines and was taking a blood pressure drug called verapamil to help prevent the headaches. But blood tests showed she had an alarming amount of the drug in her system, five times the safe level. “What drove us to write this paper was the number of new drugs that have come out in the last four years,” said Dr. Bailey, a clinical pharmacologist at the Lawson Health Research Institute, who first discovered the interaction by accident in the 1990s. How often such reactions occur, however, and how often they are triggered in people consuming regular amounts of juice is debated by scientists. Dr. Bailey believes many cases are missed because doctors don’t think to ask if patients are consuming grapefruit or grapefruit juice. Even if such incidents are rare, Dr. Bailey argued, they are predictable and entirely avoidable. Many hospitals no longer serve juice, and someprescriptions carry stickers warning patients to avoid grapefruit. Older people may be more vulnerable, because they are more likely to be both taking medications and drinking more grapefruit juice. The body’s ability to cope with drugs also weakens with age, experts say. Estradiol and ethinyl estradiol, forms of estrogen used in oral contraceptives and hormone replacement, also interact with grapefruit juice. In one case in the journal Lancet, a 42-year-old woman taking the birth control pill Yaz developed a very serious clot that threatened her legseveral days after she started eating just one grapefruit a day, said Dr. Lucinda Grande, a physician in Lacey, Wash., and an author of the case report. Some drugs that have a narrow “therapeutic range” — where having a bit too much or too little can have serious consequences — require vigilance with regard to grapefruit, said Patrick McDonnell, clinical professor of pharmacy practice at Temple University. These include immunosuppressant agents like cyclosporine that are taken by transplant patients to prevent rejection of a donor organ, he said. 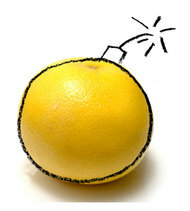 Still, Dr. McDonnell added, most patients suffering adverse reactions are consuming large amounts of grapefruit. “There’s a difference between an occasional section of grapefruit and someone drinking 16 ounces of grapefruit juice a day,” he said. And, he cautioned, “Not all drugs in the same class respond the same way.” While some statins are affected by grapefruit, for instance, others are not. ¶In general, it is a good idea to avoid sudden dramatic changes in diet and extreme diets that rely on a narrow group of foods. If you can’t live without grapefruit, ask your doctor if there’s an alternative drug for you.